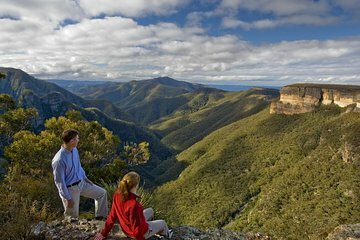 Enjoy a luxurious overnight stay in the Blue Mountains on this partially guided 2-day tour from Sydney. Visit highlights including Three Sisters, Govetts Leap, Bridal Veil Falls, Blue Mountains Botanic Gardens Mt. Tomah, and Calmsley Hill Farm for a comprehensive look at this stunning UNESCO World Heritage-listed region. Your small-group tour includes deluxe accommodation at Lilianfels Blue Mountains Resort and Spa, breakfast and an elegant 2-course restaurant lunch, transportation with live onboard commentary, hotel pickup and drop-off at select hotels, and entrance fees to listed attractions.